At the time of the May council elections this year, just five of the 54 elected councillors in the borough had promised their support to help make our streets safe and more inviting for cycling. Now, six months on, support has grown from five to eight councillors, but this still leaves no real commitment to cycling from the remaining 46. Sutton has the second lowest support for Space for Cycling in London (after Bexley). We would like to see this change, and we don’t want Sutton to get left behind (or continue with ideas such as providing cycleways on footways). 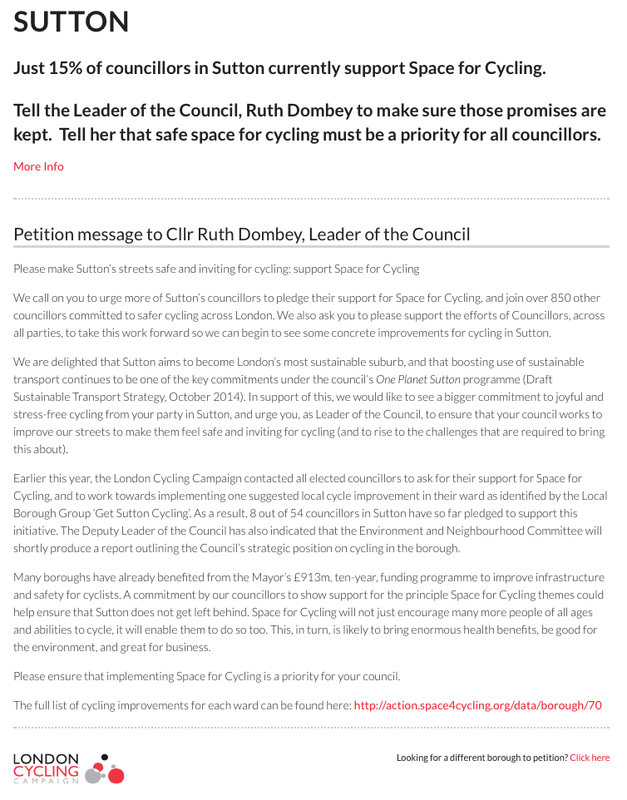 Please take a few moments to let the Leader of the Council, Councillor Ruth Dombey, know that you want to see action, and that high-quality space for cycling should be a priority for all councillors. All you need to do is visit the Sutton petition page and fill in your name, postcode and e-mail address; London Cycling Campaign’s computer system will do the rest for you. (If you live in another London borough, go to the London-wide petition page). Unless cycling becomes more of a priority for Sutton Council, nothing much is going to change for cycling in Sutton. 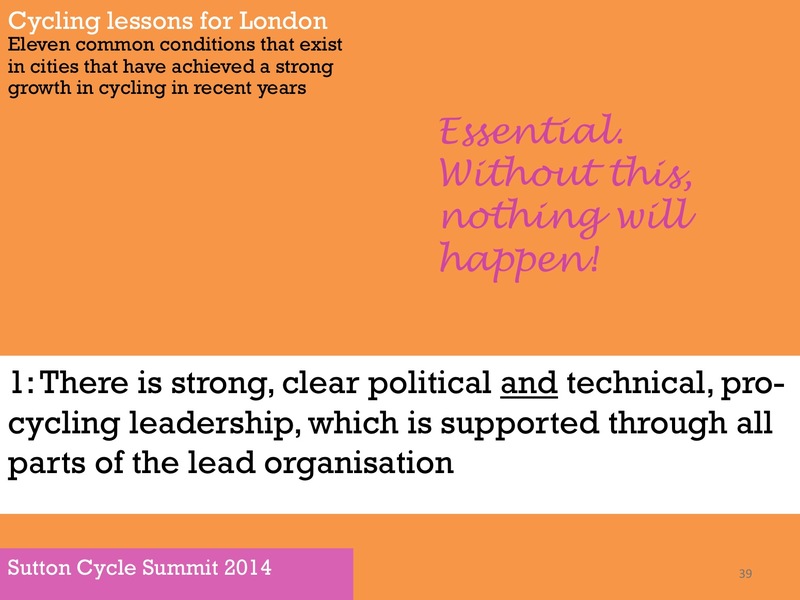 Findings from an international study last year found that the most important element or common condition, found in cities that had achieved high growth in cycling in recent years was strong, clear political leadership. It is anticipated that later this month, or early January 2015, the final report from that study (International Cycling Infrastructure Best Practice Study (Urban Movement, Phil Jones Associates) for Transport for London) will be published. You can get a sneak preview of this, including the other common conditions that exist in cities that have achieved strong growth in cycling, from Lessons from International Cycling Infrastructure – Best Practice Study. In Sutton we are aspiring to best practice, and we would like our councillors to do so too. To read the full list of the type of cycling improvements we are calling for in Sutton, see Space for Cycling: action points for Sutton. Signing the petition may just help Sutton become cycle-friendly that much sooner. Update 7 May 2015: Councillor Manuel Abellan (Liberal Democrat, Beddington South) and Councillor Hanna Zuchowska (Liberal Democrat, Wandle Valley) subsequently declared their support for Space for Cycling in Sutton, on 29 March 2015 and 14 April 2015 respectively. For more on this, see Then there were ten!